This properly shaped light hat draws attention to the rider’s face. Few things mark you as a greenhorn versus a pro like the shape, style and fit of your hat. Properly outfitted, your hat is your crowning glory. Poorly shaped, your hat will brand you as sloppy, inexperienced or worse. 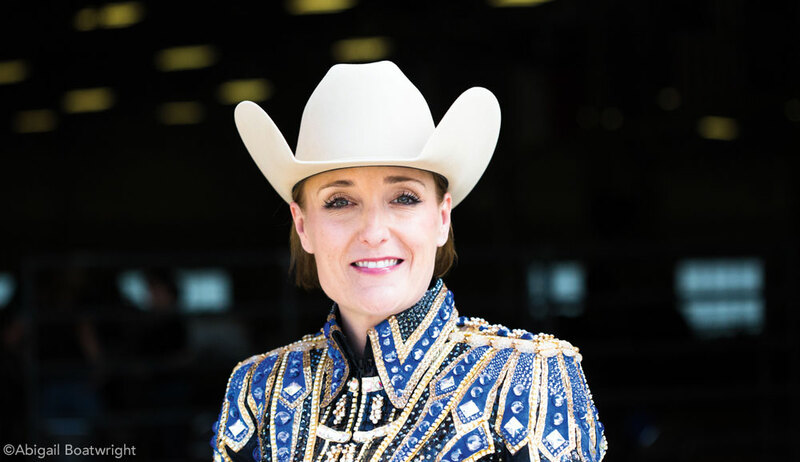 Discover your perfect hat style and shape with these tips from custom hat designer Barbara Maitia and American Paint Horse Association all-around trainer Tim Gillespie. Ask just about any western judge what they first notice about a competitor, and they’ll probably tell you it’s their hat. Often seen wearing a crisply shaped western hat himself, Gillespie has decades of experience with all-around competition, and he is adamant about the fit, style and shape of his clients’ hats. “So many judges I’ve talked to over the years have told me that if you are going to invest in anything to make sure you look good when you walk into the pen, you need to invest in your hat,” Gillespie says. He says it’s noticeable to a judge—and others—when your hat is poor quality, ill-fitting or badly shaped. Even if your hat was once properly shaped to your face, if you’ve left it out in the sun or stored it in a hatbox in a hot trailer for two years, the hat won’t look the same. “The hat shows if somebody really takes pride in their appearance,” Gillespie says. To purchase a western hat, enlist the help of a professional. 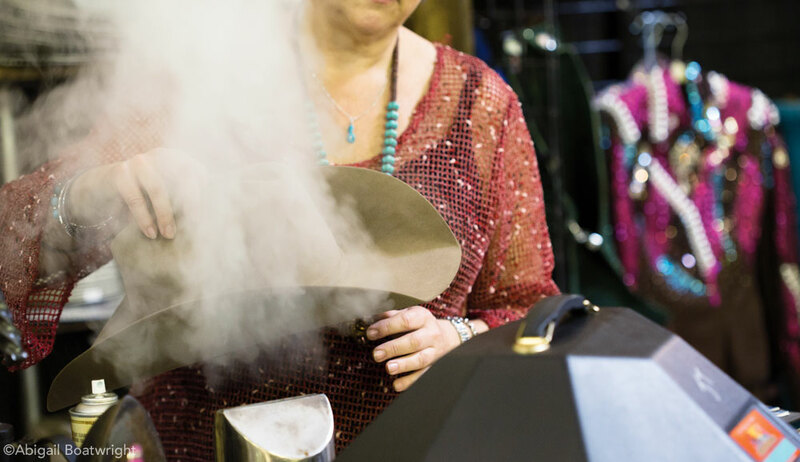 Gillespie looks to hatters with booths at horse shows for their expertise, including Barbara Maitia of Barbara’s Custom Hats in Fort Worth, Texas. For over 10 years, she has been pairing riders with the right hats, as well as shaping hats to fit riders. Even the sharpest-looking hat is no good if it doesn’t fit. 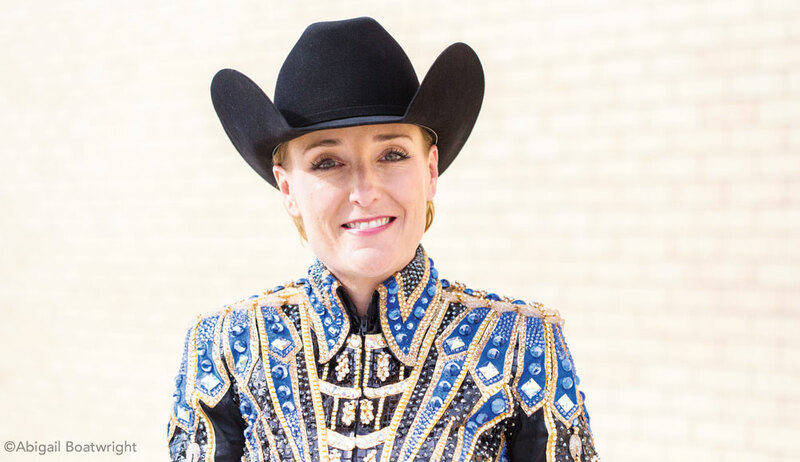 “A properly fitted hat not only looks professional, it’s essential for comfort, and most importantly, it won’t fly off while competing,” Maitia says. Gillespie adds that it should also sit level on your head without tipping forward or backward. Finding this balance is the job of a hat professional. Maitia says a hat should fit snug initially, but not too tight, resting about a finger above the top of your ears. It should not want to “pop off” when you try it on, and it should be comfortable. A properly fitted black hat is always classy and stylish. The style of your hat, crown size and brim length will depend on several factors. These include the events you’re competing in, that season’s trends and your face shape. Style: Your best resource will be a good hatter, who will know what’s “in” for each discipline. But no matter what, the shape should complement your face. “Each discipline has a typical look, but not every trending fashion look is suitable for everyone’s facial structure,” says Maitia. Brim: The most important part of the hat’s shape, in Gillespie’s opinion, is the sharp corners at the front of the brim. “I like a nice, flat front brim with really tight, squared corners at the sides of your face,” he says. The corners should be in line with your cheekbones. “If a person’s face is a little wider, I like a little wider crease in front,” says Gillespie. “If the hat is going on a child or someone with a narrower face, I like the crease to be a little bit more narrow. But it’s very important to have a nice pleasure crease.” The western pleasure crease refers to sharp corners on the front of the brim. Gillespie says some riders prefer the side brims to be more upright than others, but that can be left up to your personal taste, as long as the back of the brim has a nice rounded shape. Styles change all the time, notes Maitia. Things that are falling out of favor in the show pen include tall and pointed crown heights and small, 3 ¾-inch brims. 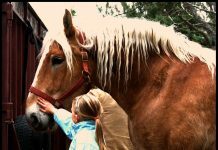 While popular in the rodeo arena and casual western wear, flat brims, extremely pulled-down brims, 5-inch brims, big and chunky hat bands, and stampede strings are all unpopular in all-around events. Both Maitia and Gillespie recommend a good quality black hat. Maitia feels that your hat completes your look, and the style makes a personal statement about you. Buy the best quality hat you can afford. Higher quality hats hold their shape better. Hat quality is expressed in X’s. You should choose the highest number of X’s you can afford. Gillespie recommends at least 20X. Maitia says a 100X hat is 100 percent fur, typically beaver. A 2X, 3X or 4X hat is made of a felt/wool or fur blend. What load of pretentious BS. A hat is meant to be a functional tool, not an accessory. Personally it shouldn’t be mandatory to require shapes or styles. It should be whatever anyone wants to wear.